JLP: Let´s talk a little bit about the name and the idea behind your museum, The Museum of Longing and Failure? MOLAF: Yes. We were in Berlin two summers ago, where we visited the Ramones Museum, which we were really taken by. We also had an experience visiting the tiny Theta Museum, here in Bergen, which is a tribute to the civil resistance in Bergen during WW2. So we started to get really interested in these very tiny museums, these labours of love that were dedicated to one very specific subject. They were usually operated by one or two people, concentrated on a particular theme that had a very specific interest. Ourselves we are often drawn to these poetic manifestations of people trying to reach out, or grow. Sometimes they achieve these extensions of themselves, but sometimes they fail, or can´t quite reach the space that they want to be in. We started to look for places where we could build the Museum of Longing and Failure, and found this place here in Møhlenpris which we thought would be perfect for our tiny museum, – across the road from the massive “Teknisk Museum”. MOLAF: Yes, the failures in life, art and literature are existential in a way. We are always drawn towards these moments of longing and failure,– when those two moments connect. It´s something we´ve talked about for a long time. 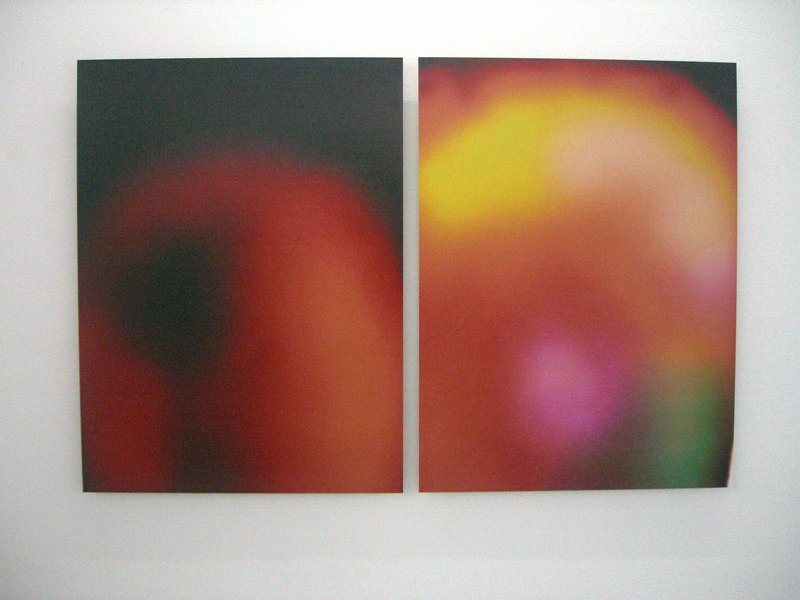 We also started to notice it in a lot of contemporary artwork, as well. There were a lot of artists who were interested in these kinds of themes. JLP: How would you characterize that moment when these two emotions or experiences meet? MOLAF: It´s a complicated space, because it has different degrees of intensity. Sometimes it can be really short and sweet, sometimes it´s more durational and happens over a longer period of time, so it can encompass someones whole life. It´s hard to put a couple of words to it, but in short, we feel that it’s characterized by the human impulse to carry on in the face of adversity. 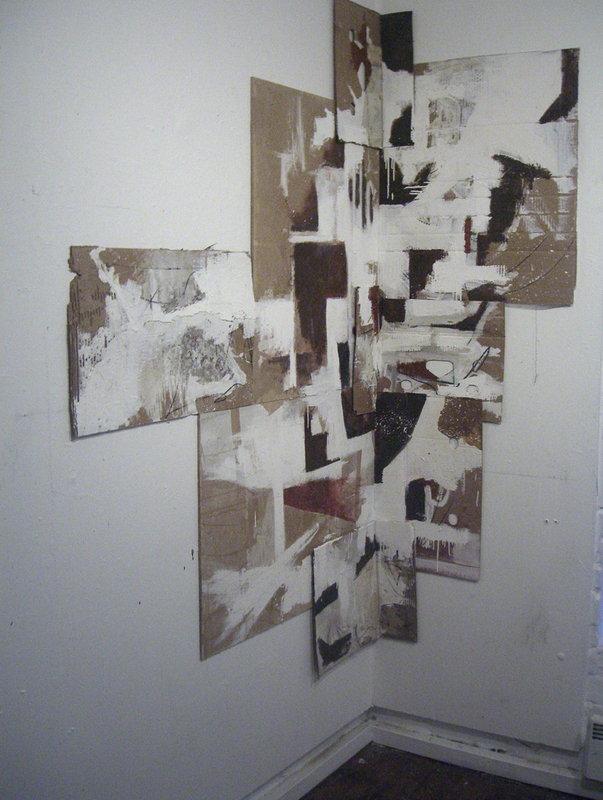 It´s more of an emotional space, which describes the longing and failure as supposed to a vocabulary. For this project, it´s been interesting to see how the different artists who collaborated with us have characterized that space. JLP: I really like the hidden spaces and places around in the city, and the MOLAF seems to fit into that kind of context somehow. Do you have a feeling about whether it has become a curiosity in Møhlenpris? MOLAF: We like that people have to search a little for it. JLP: And you change the exhibitions every month? MOLAF: Yes, every four or five weeks. It changes pretty quickly. It is really important to us that we don´t have openings or anything like that. JLP: Do you invite artists to exhibit based on the concept of the museum? MOLAF: We commission artists to make new pieces for this space. We ask them if they are interested in making a very small piece for our museum, anything that is less than 20x20x20 cm. Apart from that we usually don´t have any further conversation about it. JLP: It´s really interesting, because I am thinking about longing and failure, and I am thinking that the MOLAF is almost the opposite. It feels like it is very successful. It is a successful idea, because you are doing it, and because artists want to exhibit, and it works. MOLAF: Yes, how can something that wants to fail succeed, in a way. The thing with failure, is that it´s not necessarily a negative thing. Samuel Beckett talks a lot about failure as the only real way to approach the world. To fail is to be human, in a way, and that we can look for these beautiful moments within that kind of failure as well. JLP: It gives a lot of meaning with the Teknisk Museum as an opposite neighbour, which obviously has been longing and failing for a while. What makes the MOLAF interesting and successful is that you are using the platform and space that you already have, to make and show art. 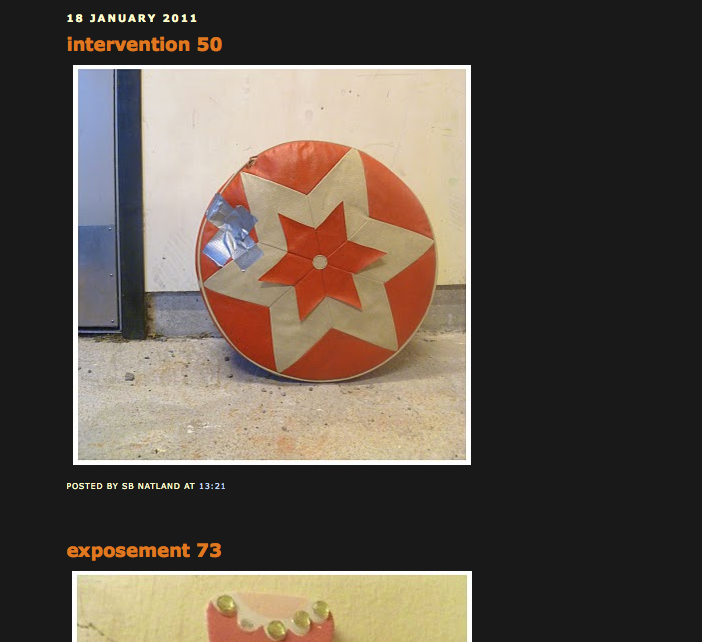 MOLAF: Yes, what we see here at Teknisk Museum is more of like an abject failure, –total, pathetic failure. Wheras the MOLAF tends to embody a more poetic way of approaching the world, that´s not about a predetermined success. JLP: You have been showing Canadian and Norwegian artists. Is that something that you are going to keep on doing? MOLAF: We always make sure that we have two Norwegian artists in each show, because it is a Norwegian museum. As we are from Canada, we thought it would be nice to bring these two things together. But from next year we are thinking of broadening it up a bit, to more Nordic artists. We are going to Iceland and Denmark this year, and we have a Finnish artist showing in the MOLAF next month. JLP: Do the artists give you their work for the MOLAF to keep? MOLAF: The artists are commissioned by us, so they give us the work to keep. We are planning on showing the pieces again and again, as the space grows, as well as collaborating with other places to show. The plan is to do two years of programming here at the MOLAF in Møhlenpris, and then put out a volume of the archive. JLP: Could you talk about the exhibition that is here now? MOLAF: There are four pieces showing together. Jason de Haan, who has been has been working with the idea that if you put a gold band over a tree,–over time the tree will envelop the gold ring as it grows out. His sculpture Future Future Age is a petrified piece of wood. It feels like stone, and it has a gold inlay, which creates that ring. The piece next to it is Elizabeth Zvonar, a Canadian artist. Her piece Hills are her casted heels. Moving down is Stein Rønning, a Norwegian artist. 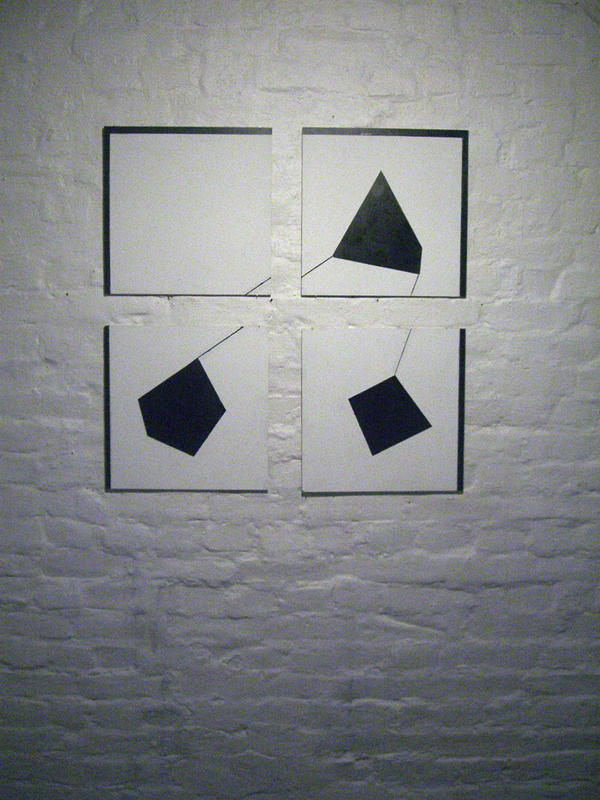 Small Fold for Storms gate ,– if you know his work, it´s very much a Stein Rønning kind of piece. 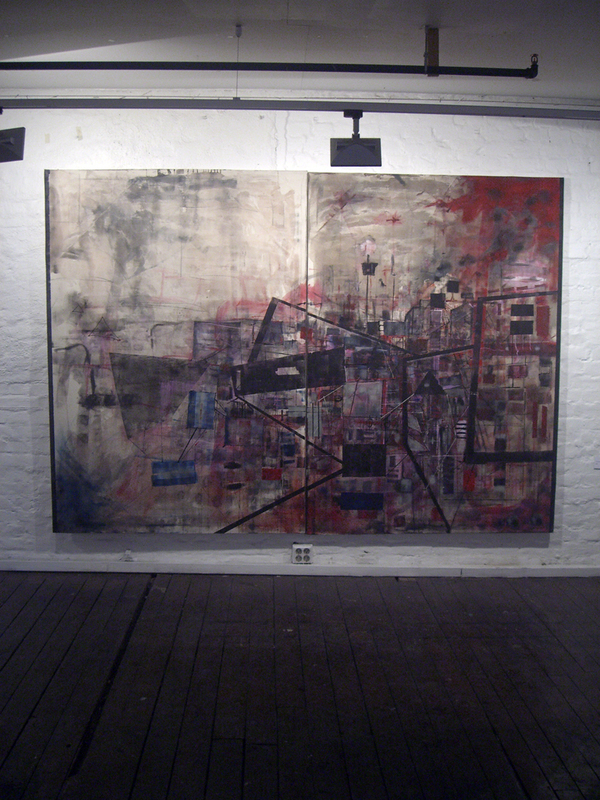 JLP: I´ve only ever seen pictures of his work, but he often exhibits pictures of his work, doesn´t he? MOLAF: He does. He has actually asked us, that once this is done we only ever show a photograph of this in the future. The last piece is made by an Oslo–based duo, Lello//Arnell. 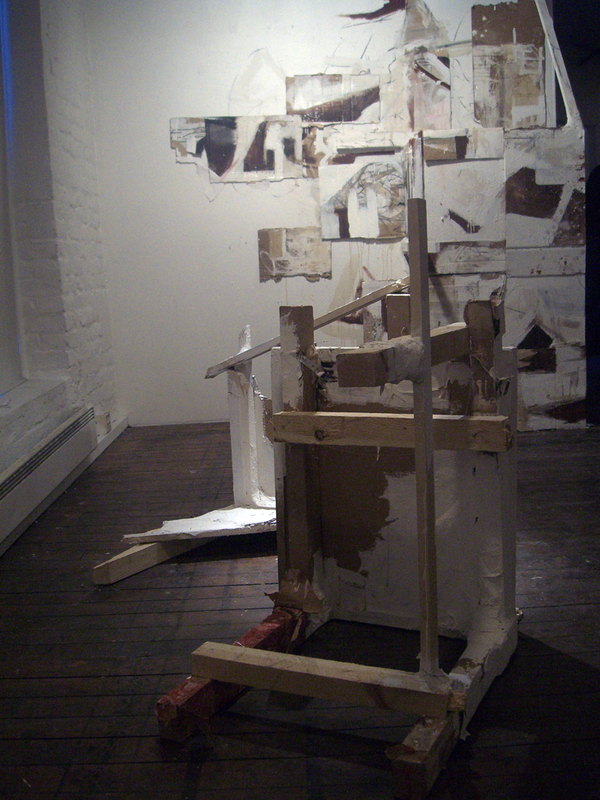 The piece is titled Critical Failure (The End of Physics) . It´s a collapsed Newtons cradle. It´s amazing how well the pieces all work together, without us matching them up. We feel that every show has this very particular kind of connection between the works. The MOLAF is initiated and run by Canadian artists Chloe Lewis and Andrew Taggart, who are currently based in Bergen, Norway. Det er alltid spennende å se hva som skjer på student-galleriet til Strykejernet Kunstskole. Det er noe med energien i verkene til de helt unge kunstnerne, som dessverre altfor ofte bukker under innenfor akademiene. Kanskje det handler om en optimisme på kunstens vegne? Det ga i alle fall et lite kick å se disse arbeidene i Galleri Brenneriet. Maleri (uten tittel) av Eirik Mikkelborg. Galleri Brenneriet, Strykejernet Studentgalleri. Installasjon av Sindre Hustveit. Galleri Brenneriet, Strykejernet Studentgalleri. Foto: Vilde Andrea Brun. Videre vises bilder fra to fotoutstillinger, en på Stenersenmuseet og en på Fotogalleriet. 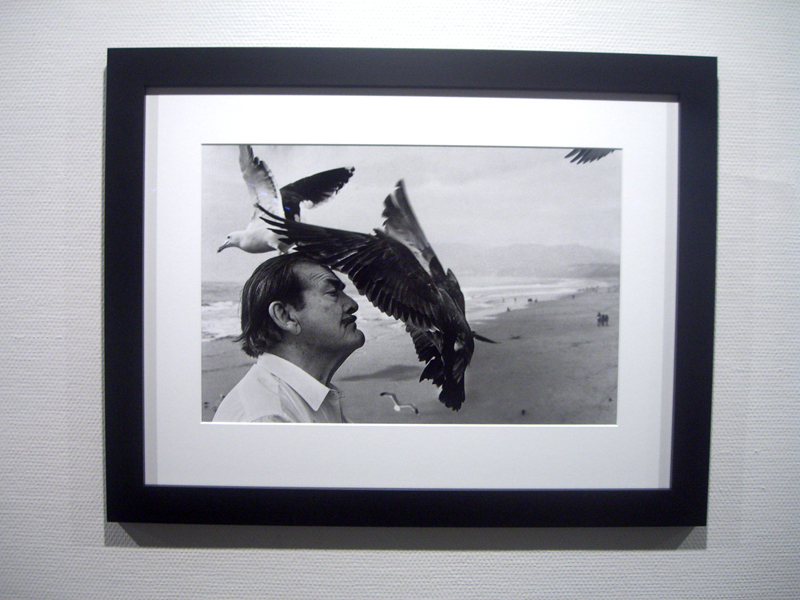 Fotografi fra utstillingen “As We Are” av Just Loomis. Foto:Vilde Andrea Brun. 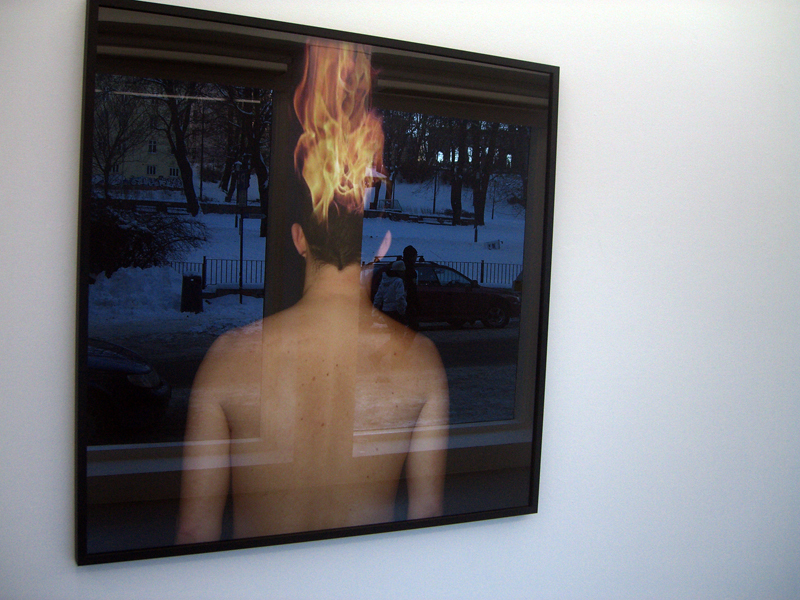 Trine Lise Nedreaas, Incident, 2011, Fotogalleriet. Foto:Vilde Andrea Brun. 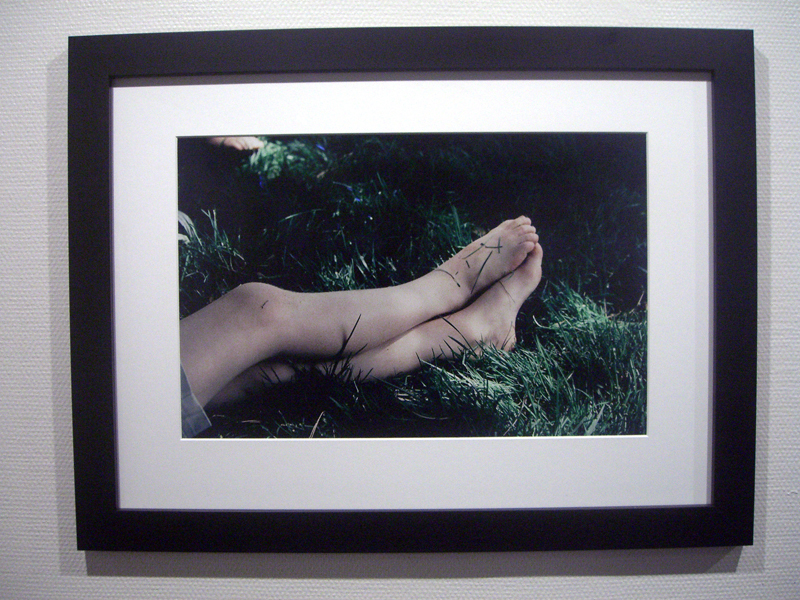 Trine Lise Nedreaas, Neither Here nor There, 2011, Fotogalleriet. Foto: Vilde Andrea Brun. 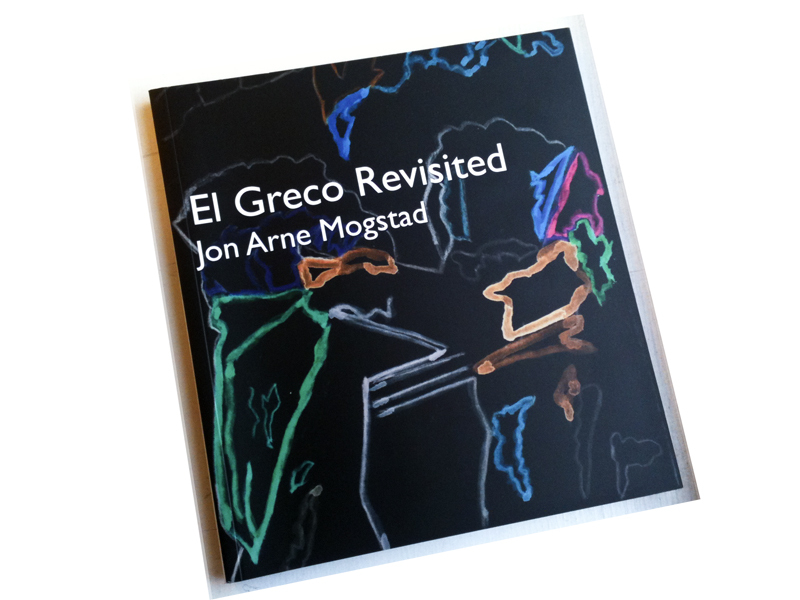 Ytter anbefaler Jon Arne Mogstads El Greco Revisited. En publikasjon som tar deg igjennom prosessene, tankene, minnene, opplevelsene, irritasjonene og fascinasjonene til kunstneren Jon Arne Mogstad. Et herlig språk så nært kunstnerskapet som det skrevne ord kan komme. Personlig og ærlig (nei, jeg har ikke rukket å lese hele ennå, men det skal jeg..) Og maleriene naturligvis. På mange måter er dette også rik kunsthistorieformidling, da Mogtad deler sine kunstopplevelser gjennom mange år som bruker av kunsthistorien. Jon Arne Mogstad sitt bokprosjekt er utkommet som et sluttprodukt av en FOUperiode på Kunsthøgskolen i Bergen, der Mogstad er professor i maleri.